As December wears on, many of us are debating calling in sick for holiday parties or simply taking advantage of the liquor along with anyone lacking quick wit around us. Thankfully, those equally snotty types at Enlighten have streamlined the process of holiday party excuses. 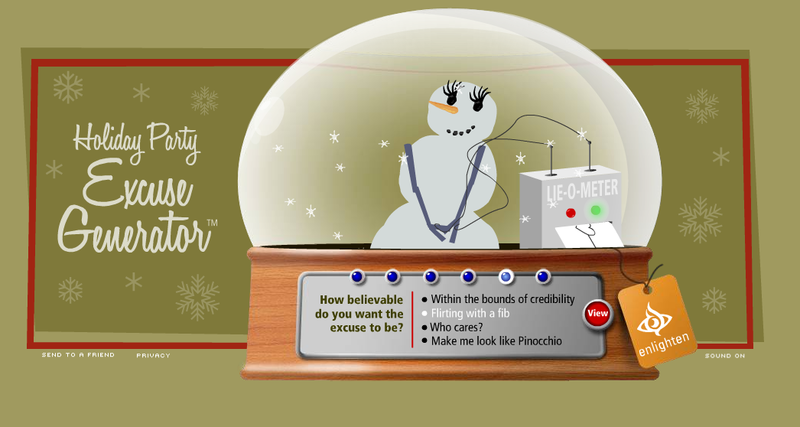 While not providing any excuses for inebriated interns, xerox machines, locked doors, hangovers, or affairs, the Holiday Party Excuse Generator does at least give you snippy ways of avoiding the chaos. On the other hand, you may be able to snag some job security with a digital camera in tote if you do decide to make a cameo.